Midway through last year, Nakumatt Holdings unveiled an internal initiative to reduce the use of plastic and paper bags across its branches in East Africa through an elaborate behavioural change campaign. The Nakumatt campaign is geared at imploring shoppers to consider allowing their shopping to be packed in reusable bags, used cartons and bales instead of plastic or paper bags. The project has already started bearing fruit, with Nakumatt managing to reduce its plastic and paper bag usage by more than 15% in less than six months. However, the hard part of ensuring project sustainability has just started. To encourage the uptake of the project, Nakumatt Smart shoppers now earn two extra smart points every time they shop with their reusable bags at Nakumatt. 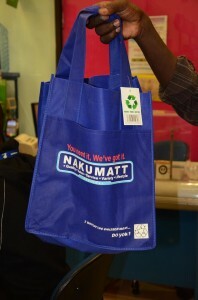 In addition, a donation of KShs.5 is made by Nakumatt Holdings to AMREF for every purchase of a Nakumatt reusable bag. All of these efforts are geared toward reducing the consumption of plastic bags. Before rolling out the campaign, Nakumatt’s internal research findings confirmed the viability of the initiative, which is projected to provide a more than 50% cut on the firm’s use of plastic and paper bags in the next two years. Nakumatt believes that the plastics war can only be won through an integrated, focused and sustainable approach such as the ambitious Nakumatt campaign which is geared toward sensitising end users. Through such a campaign, Nakumatt was able to engage their shoppers to adopt a more responsible attitude by refraining from the use of plastic bags and opting to use reusable bags. Besides shoppers, Nakumatt is also engaged in a consultative process with key suppliers to reduce unnecessary use of plastics in product packaging. Encourage consumer behaviour change over time, focused on reducing bag use, effectively reusing bags and recycling them at the end of their useful life. Across the region, and with daily customer traffic of close to 150,000 customers daily, Nakumatt facilitates the dispensing of more than 350,000 plastic and paper bags. Nakumatt believes that through this campaign they will encourage at least a million shoppers to reduce their usage of plastic bags and accept goods packed in paper bags, reusable bags and even paper bales. The desired effect is to reduce Nakumatt’s 350,000 daily dispensing to less than 50,000 paper bags in five years. This project is spearheaded by all of Nakumatt’s 5,500 staffers across Kenya, Uganda, Rwanda and Tanzania. The project is expected to provide positive impacts going forward as it encourages and sensitizes the final consumer to play an active role in environmental management. Use of reusable bags is an effective avenue to instill discipline and ownership amongst consumers. Non-woven plastic (polypropylene) or ‘Green Bags’ are manufactured from polypropylene gas, a by-product of oil refining. 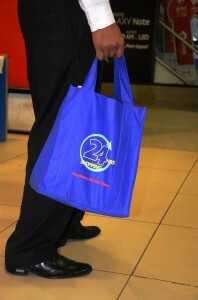 They are strong and durable, and can hold more than a conventional single use HDPE shopping bag. The Project has already started bearing fruit; Nakumatt has managed to reduce its plastic and paper bag usage by more than 15% in less than six months. However, the hard part of ensuring project sustainability has just started. So far, Nakumatt Holdings has invested more than US$5million in this project. The Nakumatt Project was inspired by a series of research studies. As a responsible corporate organisation, Nakumatt has been actively seeking avenues to ensure business sustainability, covering: revenue generation, footprint expansion, human resource development and, most importantly, environmental sustainability. Nakumatt is aligned with the emerging global trend that indicates the mainstreaming of environmental and social criteria in the business arena, and which means that future success lies with businesses ensuring they are, and are seen to be, good operators. Due to the nature of Nakumatt’s business, the company knows that it has to brace itself at the prospect of voluntarily reporting in more detail on the application of environmental innovations and the environmental and social performance of its products. Examples include innovations to reduce electricity use in stores, use of reusable bags, packaging of products and the provision of eco-friendly and eco-labeled products to customers, such as organic foods. Nakumatt’s voluntary role to raise public awareness amongst its customers will eventually have a major ripple effect, helping curb and reduce the use of plastic bags in coming years. This reflects on corporate social investment more than just environmental excellence.